Cellucor is one of the world’s largest sports nutrition brands, and has been for a good long while now. I think this is a company that many folks consider there go-to, and I have to say, I will probably have many more tubs of C4 in my day, just because it’s so easy to get. But C4 Ultimate, now this is a whole new ball game. This is a pre workout that Cellucor made to go after your big-time, ultra-premium, big-scoop guys. The Pre Jyms. The Pre Kaged’s. That WHOLE market. Being a fan of both Jym and Kaged myself, I was supremely curious to see if C4 Ultimate could hang. I’ve reviewed the C4 Ripped pre workout, which didn’t measure up to a Cellucor standard of quality in my opinion. Of course I’ve reviewed the original C4, many years ago. So there’s a tremendous history of Cellucor here on the BPW. And I’m ready to write the next chapter in the C4 Ultimate Review. Ready Eddy? Me too. Let’s talk flavor. Cellucor C4 Ultimate Tastes Great. The chap at GNC was kind enough to give me a scoop out of an open jar of Cellucor C4 Ultimate. Hailed as the best version of C4 yet, I could hardly wait to dump it into my shaker and get things started. And that’s exactly what I did. I found the blue raspberry flavor to be up to a Cellucor tasting standard. It was not QUITE as strong as some previous Cellucor products that I’ve had. But it was quite pleasant and flavorful. I’ll give them an A on the blue raspberry. * The footnote is that I don’t know if the guy gave me just one serving or a half serving or two- my guess is it was only one, which would explain why I thought C4 Ultimate might taste less strong that regular C4, which I usually dose at 2 scoops (minimum). Lol. So that’s flavor. How does this stuff WORK? Cellucor C4 Ultimate Works Pretty Awesome. I’ll tell you- I went into my workout ready to crush. BUT. Here’s something crazy. I honestly was less energized on C4 Ultimate than on regular C4! I know. WHAT. I don’t know if that’s because he gave me a small serving or what but, I really was more focused than hyper, which the regular one makes me. However. That being said, I could feel Cellucor C4 Ultimate start to kick a little harder and harder as my workout started to pick up. And I did almost 8 pullups for the first time since college. Right out of the gate. How’s that for strength comparison right away? I really think that the strength of Cellucor C4 Ultimate pre workout is in the strength department. Endurance is good. Focus is good. Pumps are good. Energy is good. Strength might be GREAT. Endurance was pretty good. Overall everything was, surprisingly, strong. Not blown away, but very solid all around. Does Cellucor C4 Ultimate Have Any Side Effects? So. Here’s the thing, and let’s just talk formula now. I know there is Theacrine, huperzine, and Alpha GPC, and I swear, going off my headache, a bit of agmatine sulfate in here. I am a little bit down on Theacrine because I swear it makes me moody. I’m a little down on huperzine because it makes me nauseous about an hour after ingestion. And I’ve always been down on agmatine because it gives me headaches. I’d also prefer them leave creatine out of here, although with it being Cellucor C4 ‘Ultimate’, they pretty much had to ‘kitchen-sink’ it, if you will. So. Yeah. It’s a great big old formula. For me all of those side effects are pretty mild. Like. Nothing I can’t handle, and probably worth all the minor discomforts. Oh and lastly the beta-alanine will light you up tingle/itch-wise. I swear Cellucor uses an extra-itchy brand of beta-alanine in their C4 pre workouts. Lol. Cellucor C4 Ultimate Looks Dope. I mean. What more do you really need to say about a Cellucor product. Of course they are going to make it look fresh to deaf. The Cellucor C4 Ultimate pre workout has many similar design elements of your standard C4, but the overall theme is turned dark. Sort of like a blacked out Cadillac Escalade from an old Birdman music video. You 90s kids feel me. Lol. But yeah what can you say. It’s Cellucor. 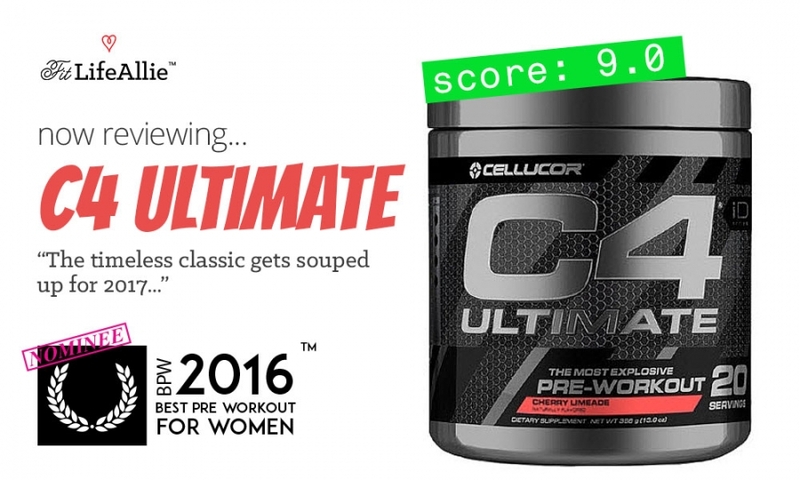 Did you really expect Cellucor C4 Ultimatet to get anything less than A+ on packaging? of course not. Cellucor always crushes.